Have you encountered unruly behavior of service crews? Blood on fried chicken? Dirty restrooms? I’d encountered a lot of rude waiters, nasty managers, no available water and tissue papers in their comfort rooms. 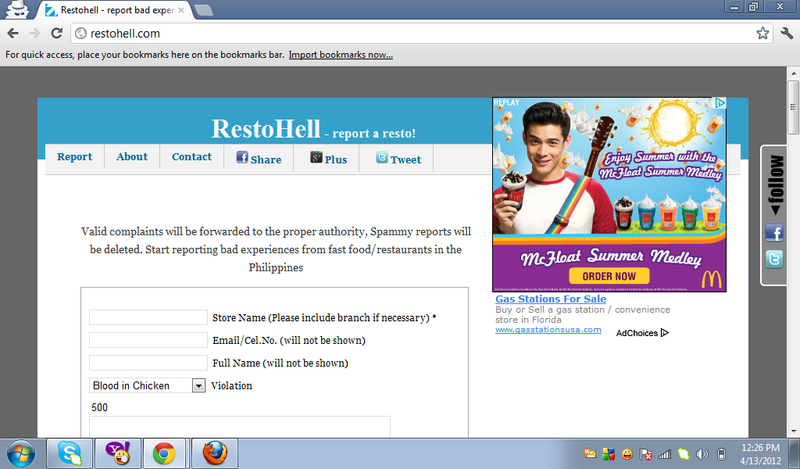 If you want to complain anything about an eatery or fast food joint, here’s a website wherein you can report any untoward incidents at Restohell. They also send reports to the proper authority. All you have to do is to fill up the form and they’ll take action on your complain.